Steven Ratzlaff is set to debut his new play Reservations at the Rachel Browne Theatre (211 Bannatyne Ave), where it will run from March 10 to 20. This Theatre Projects Manitoba production attempts to challenge common views and opinions about the real cost of being settlers, and poses tough questions about our home, identity, and history as Canadians. The first act of Reservations focuses on a battle between foster parents and the Aboriginal Child and Family Services agency responsible for their children, while the second tells of the philosophical and spiritual journey of a Mennonite farmer who gifts his land to the Siksika nation. 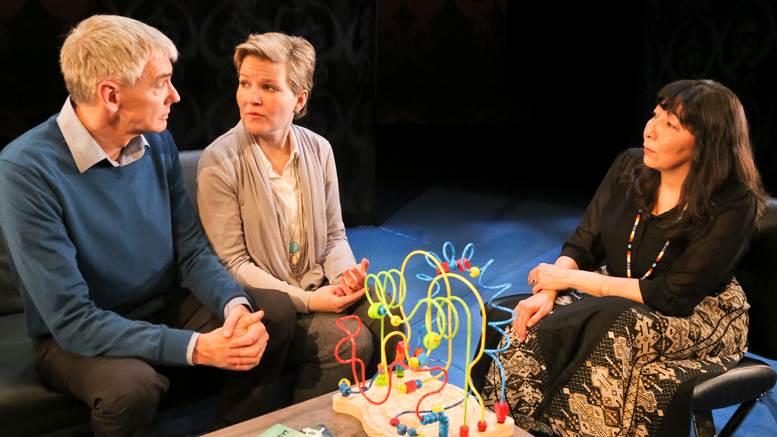 A playwright who does not shy away from politically controversial subjects, Ratzlaff points out that there are issues in this play that will resonate with every Manitoban regardless of their beliefs. “I don’t think it is possible to be an awake Manitoban without feeling some kind of personal relation to issues like these,” Ratzlaff told the Manitoban. Reservations will be co-directed by Ian Ross – a recipient of the 1997 Governor General’s Award for English Drama – and Emma Tibaldo, the artistic and executive director of Playwrights’ Workshop Montréal. Together, Ross and Tibaldo hope to get their cast – consisting of Ratzlaff himself, Tracey Nepinak, and U of M alum Sarah Constible – to creatively draw the line between performing and making political statements. “Every good play asks good questions,” said Ross. Nepinak told the Manitoban that she too is excited about this type of politically charged, provocative theatre. For these thespians, the issues addressed in this play are very close to home, and it could be quite challenging to stage a performance. However, all involved recognize the importance of raising awareness and provoking thoughts amongst their audience. “It’s challenging but it feels dangerous,” said Constible. According to Nepinak, Reservations is simply telling a story with the honesty and directness it needs. “My late husband said one time, ‘being an Aboriginal person in Canada is a political act, you can’t just be neutral about anything.’ For me, that is part of who I am,” Nepinak explained. The stories told in Reservations are curated to both educate and entertain Canadians of all ages. That being said, the play does pose a challenge to young people who are unaware of, or have questions about our nation’s history. “You are young and an adult, and in an intellectual stream of your life right now where you get to absorb so much different information and do something with it,” said Constible. Tickets to Reservations are $15 for students, $20 for seniors, $25 otherwise, and are available online at www.theatreprojectsmanitoba.ca along with specific show times and dates.